This editorial appears in the March-April 2010 issue of This, which will be in subscribers‘ mailboxes and on newsstands next week. 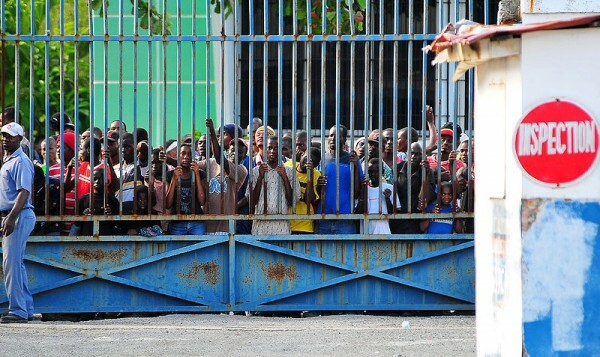 Haitians awaiting relif supplies in Port au Prince, January 15, 2010. The earthquake that devastated Haiti on the afternoon of January 12, 2010, viscerally illustrated the need for responsible, long-term, sustainable development. For many thousands of Haitians, poverty must be considered the true cause of death. The cost to Haiti in human lives is beyond measure, but the quake also destroyed the rotted foundations of the Haitian government and threatened its already fragile civil society. As the full horror of the disaster began to trickle out and the death toll rose to an estimated 200,000, aid agencies, governments, and ordinary citizens collectively pledged millions of dollars to support relief efforts. Canadians can take some small comfort in knowing that we responded far out of proportion to our size and population: in absolute dollar terms, Canada’s total pledge of US$131 million is second only to the United States, and we gave more per capita than any other country. Following that outpouring of compassion and hard cash, it seems cranky to complain that it’s not enough. But it’s not. Haiti was a disaster area long before the quake hit. This was simply the catastrophic climax of a centuries-long story of colonial oppression, financial exploitation, political meddling, and humanitarian neglect. From France’s astonishing 150 million-franc charge for its slave colony’s independence, to the murderous homegrown government of “Papa Doc” Duvalier, to the 2004 coup—the 32nd coup in 200 years—that ousted Jean-Bertrand Aristide, Haiti has suffered near-continuous calamity, much of it inflicted by outsiders—though there was plenty self-manufactured, too. The world’s late-breaking compassion for the people of Haiti is still valuable. But the fact that it apparently takes the wholesale destruction of a country to grab any significant attention is a shame. It’s easy to open your heart and your wallet when the headlines are screaming. But the day-to-day truth is that Canada is nowhere close to meeting its long-standing target of contributing 0.7 percent of GDP to aid. We currently lag around halfway to that goal, which was first set by Prime Minister Lester Pearson in 1969, renewed by a unanimous parliamentary vote in 2005, and has never once been met. It’s currently trendy to dismiss international aid as condescending and ineffective, a waste of effort that props up dictators or kills entrepreneurial spirit or both—an idea that free marketeers have diligently worked at circulating. But the real waste is spending money to pick up the pieces after a disaster, rather than investing for the long term in projects that strengthen infrastructure, stabilize governments, and improve living conditions, allowing societies to better withstand sudden shocks. Haiti needs our help more than ever now. But the rich nations ought to be haunted by the thousands whose lives would have been improved—perhaps even saved—if we had fulfilled our pledges years ago.